Sometimes we really don’t know the behavior of an animals,according to study this type of snake is a very dangerous it can kill a person even just a couple of minutes after bite. It can sense any movement around them. It is also a type that has very good vision; they use their tongue to taste their food. 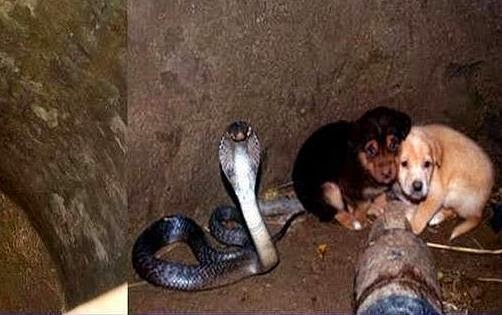 But in one of the city in India a two puppies and a snake was trap inside the well, as you can see it seems that a cobra is guarding the puppies and trying to protect them from any invaders. The mother of these puppies is barking above telling their master that its puppies are inside the well. After an hour their master found out that the barking mother is telling him those puppies was fall inside the well. It is very lucky because a well don’t have water anymore. But when he tries to rescue the puppies surprising he get shock when he open his flashlight and heard a snake noise trying aggressively telling that it is their territory. So the master decided to call a professional to help him to rescue the puppies. After almost 48 hours a forest department came and rescue the puppies, a hopeless master think that puppies can’t survive anymore because cobra may attack the puppies and even a single bite it can kill them. Then after a minute a rescuer see that puppies are happily together while guarded with a cobra. People there was amazed that they can’t imagine that a cobra whose said that very dangerous and very aggressive don’t hurt the puppies. A snake is really don’t like to have any companion on their place they attack people or animals that they think to evade their territory but in this sense maybe the cobra don’t mind the puppies and on the other hand cobra guard the puppies and keep it safe until rescue came. After a rescue the snake was put on their natural habitat on the forest. We really can’t judge things, we always put in our mind that if we see a snake it is dangerous , but the truth is a snake can only be aggressive if they can sense harm and if they were attack from their territory. Let’s just stay away from them and please don’t try to kill them because they are very useful in food chain.